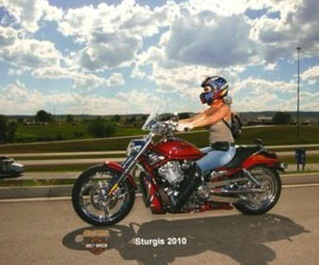 Athena's Flash of Lightning is my 2005 Screamin' Eagle V-Rod. We have bought her some cool led accessories and custom etched led windshield. She looks like a million bucks at light speed when she's sitting still and she is my first Harley after Ninja's and FZR's for years. Flash was my engagement ring. How can you turn down a handsome man bearing a hot bike??? I have the same bike! Bought it new in Alabama. I get more compliments on it & the guys always want to race. Looking good! They are actually half chaps (aka gators) over regular HD riding boots. I got mine at the Leather Mill in Cave Creek, Arizona. I can't locate a web address but 480-595-1070 is the phone. Nice bike. My boyfriend has the anniversary edition of the v-rod. He loves that bike. Yours is very nice. Can I ask where you got your boots. I love them. That is one beautiful bike. I've always loved the V-Rods! My friend's son has one that is just collecting dust in his garage, letting the tires go flat. It just breaks my heart. If I could afford it, I would buy it from him today. What a perfect engagement ring!!! That's an awesome engagement ring! The windshield is a flaming heart with thorns and my name beneath. What kind of design do you have on windshield? Now that is the kind of engagement ring I would want!!! You go girl Oh I'm coming to Scottsdale in November to see my mom, maybe will see you on the street!!?!?! ?